A look at the Minecraft-esque simulation RPG. The first screenshots and official Japanese box art for Nippon Ichi Software’s newly announced PlayStation 4 simulation RPG Hakoniwa Company Works have come out via Amazon Japan. The game is set in “Cloud’s End,” a world where countless islands float about the sky. The islands, which are isolated throughout the sky, are each building their own cultures. Connecting such islands are “companies” that are contracted for the cultivation and manufacturing of islands all over the world. Players will become the leader of a newly formed company and, together with their partner Meme, take on various requests. Destroy, create, and get stronger! A new simulation RPG from Nippon Ichi Software appears! Strike both the enemy and stage with super flashy techniques! 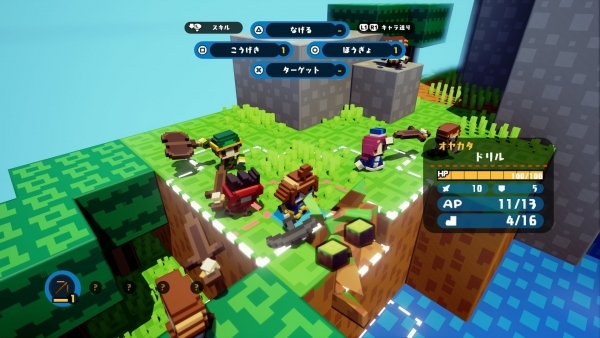 Maps are made up entirely of blocks in this game, which you can destroy with various attack techniques while fighting. It’s a simulation RPG with a fresh feeling. The setting of this game is a world in the sky where a multitude of islands made up of blocks float about. Players will become the “leader” of a “company” that connects these islands and take on requests from all over the world. Hakoniwa Company Works will launch for PlayStation 4 on July 13 in Japan for 6,980 yen. First-print copies will include a “Character Drawing 100 Parts Set” download code. View the screenshots and box art at the gallery.